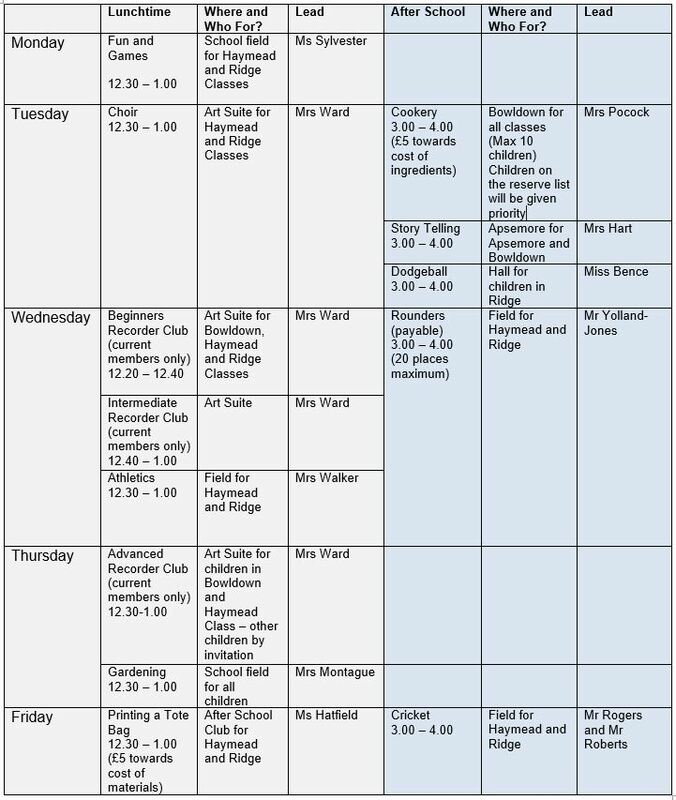 We offer a wide range of clubs for our children. This year children have had opportunities to learn new skills, such as playing the recorder or learning how to knit. We have had sports clubs such as Tag Rugby, Cross Country, Hockey, Netball, Football, Sports Leaders and Gymnastics. Other clubs have been Making Things, Nature, Craft, French, Chinese, Music Ensemble, Construction, Choir, Fizz Buzz Science and many more. Children in Key Stages One and Two are offered the opportunity to learn the recorder. They are also able to learn an additional instrument for a reasonable charge. This year children have learnt to play the violin, flute, piano, clarinet, keyboard, guitar, drums and music technology. Oboe and Saxophone lessons are also available. Children in Haymead Class will all be learning how to play the ukulele.